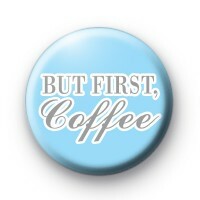 Blue and grey coffee addict 1-inch button badge. This badge is for all coffee lovers. It has the words 'But First, Coffee' written in a grey and white font. Are you someone that needs your coffee before you can function? This is a great badge to pin to your coat just to let people know you need your coffee before anything will get done. All our badges are handmade in our Cornish workshop.